All available Chinese language variants should be listed as a separate language in the language selection overlay. Open Other Languages again, should see the Simplified Chinese in the list. On Chrome browser, clicks the link https://zh.wikipedia.org/wiki/贝拉克·奥巴马 and read the article in the Wikipedia app. During development, we should be sure to test against the scenario below. More information on T191629. Pre-conditions: While logged in with no user-preferences set on zh.wiki for reading in a particular variant. Nothing changes since the default user preference of 'zh - 中文' overrides the variant transform and shows article with mixed content. This is the case for ALL Chinese articles, whatever the first starting point variant is chosen, changing to the other does not work. JMinor triaged this task as Low priority. Has this been fixed in the most recent internal build? Sadly I can't read Chinese or distinguish well enough across the different variants, so any insight on how I'm misinterpreting the current state of the app would be very helpful! cmadeo added a subscriber: cooltey. 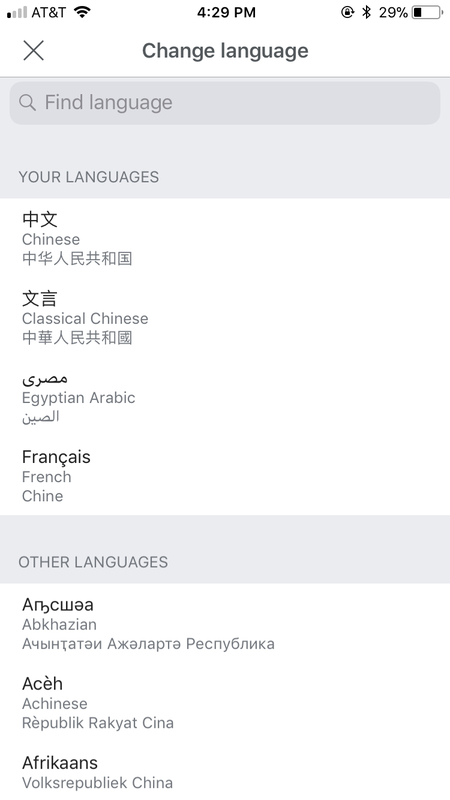 From the screenshot you have provided, I do not see two of the mainly Chinese variants show in the list: Traditional Chinese and Simplified Chinese. For example, if a user is reading the zh-hant (Traditional Chinese) version of Barack_Obama, then the user should see the Simplified Chinese in the other language list. @cooltey Thank you so much! This is super helpful! 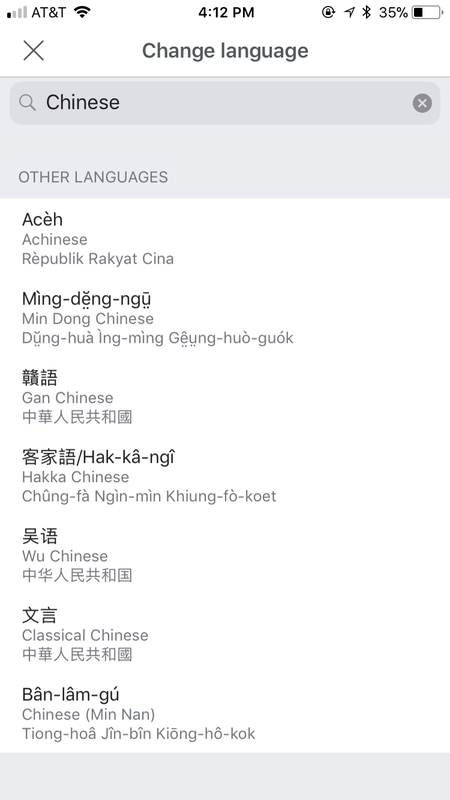 Do you think that it would be an acceptable solution to have each of the Chinese language variants available for a given article to be listed as a separate language (similar to how they are handled on the iOS language preferences) or would you expect to select the language 'Chinese' and then pick from there? In my opinion, it is totally acceptable for each of the Chinese variants to be listed as a separate language. For the Android version, we programmatically convert the zh to zh-hant and zh-hans and list as a separate language. When reading an article in either zh-hant or zh-hans, it can be converted into each other. @cooltey Great, thank you so much for explaining the approach taken on Android. We'll do the same on iOS. cmadeo moved this task from Design Doing to Needs Acceptance Criteria on the iOS-app-v5.7.4-Dachshund-On-An-Elk board. JMinor moved this task from Tasks from Product Backlog to Needs Design on the iOS-app-v6.0-Walrus-On-A-Unicycle board. Hi @cmadeo - FYI T191629 may also be an issue to be aware of on iOS. Basically when someone is logged in, the user-preferences (on zh.wiki) are overtaking the whichever variant is selected. By default, a user's preferences is just zh - 中文, which overrides whatever variant is selected and shows mixed variant content. @RHo, thanks so much for sharing this. As this ticket hasn't been picked up yet, I'll add the bug to this ticket.